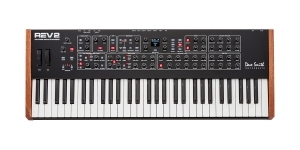 Dave Smith’s Rev2 Desktop is simply a keyboardless Rev2 and features 16 voices of polyphony, dual DCOs, integrates a 2-/4-pole resonant low-pass Curtis filter, offers waveshape modulation, bi-timbral operation, built-in effects engine, polyphonic step-sequencer, knob-per-function programmability, enough control for real time tweaking, integrated power supply and USB support. 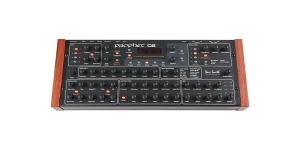 Prophet Rev2 Desktop allows for same 16-voice splitting into 2 complete 8-voice synthesizers. 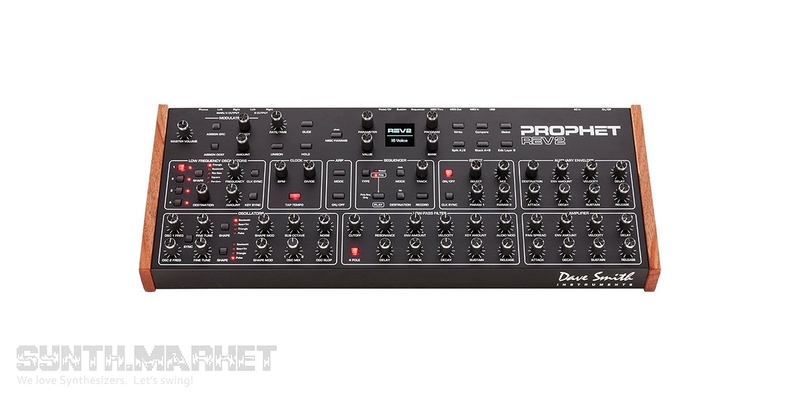 Rev2 Desktop is a boost-it-all version of a Prophet ’08 featuring an upgrade out of each and every detail. 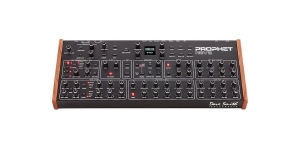 The uploading of the Prophet ’08 libraries will let them sound adjusted with the new features of the Rev2 Desktop. Each of the voices has its own dedicated low-pass filter based on a chip designed by Curtis. The famous 2-/4-pole resonant filter presents an Audio Mod control for dialing motion and harmonic complexity. The pulse width of the waveform is continuously variable owing to the waveshaping modulation feature. The Shape Mod control lets you use a modulation source to sculpt the timbre or you can dial some width amount as well. There are two digitally controlled analog oscillators per voice offering 4 waveforms including sawtooth, sawtooth+triangle, triangle, and square. Enjoy working with layered voices thanks to poly 64-step sequencer (6 notes per step) which can also be applied as a modulation source. The sequences can be synced to an external MIDI clock as well as an arpeggiator which allows for note repeating. The effects section delivers juicy reverbs, delays both standard and bucket brigade, ring modulation, phase shift, distortion and chorus. Every layer can be fed with a unique effect while effects parameters can be modulated with a Mod Matrix which is now doubled. 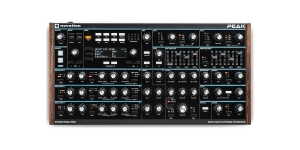 Rev2 Desktop offers 512 factory and 512 user patches. The build quality is as convincing as DSI instruments can be. You can take the instrument wherever you want considering its integrated power supply, USB support and precise OLED display, or use in a studio. Rev2 Desktop gives you the same functionality as Rev2 keyboard version does but delivers it in a compact sturdy housing which you can place any surface you want or take wherever you need with you. Sound Module/ Tone Generator, Analogue (A), Polychain: 16 voices, Voices: 8, Multi Timbral Capacity: 2 part(s), Oscillators per voice: 2, Sub-Oscillators per voice: 4, Production start: 2008. 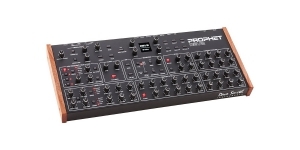 Dave Smith Instruments has announced the release of a new version of its polyphonic analog synthesizer Prophet Rev2. In October 2017 all fans of the brand will be able to purchase a keyboardless version Rev2 and save a few hundred dollars and a room in their studios. 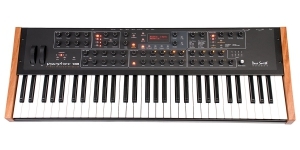 The synthesizer has all the distinctive capabilities of the original keyboard version, in a more compact package, without a keyboard and with a slightly truncated interface. 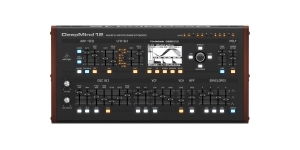 Never before 16 analog voices, Curtis filters, a set of built-in effects, an arpeggiator and a 2-mode sequencer, were not given at such a similar price!